Introducing Our Talented & Dedicated Team. 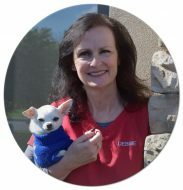 Our veterinarians are highly trained individuals dedicated to the health and well-being of your pets and are backed by a group of experienced technicians and team who treat your furever friends with compassion and respect. 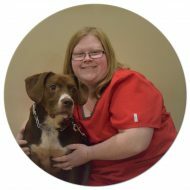 Explore our staff biographies and learn about the people who make our hospital an excellent choice for your pet care needs. 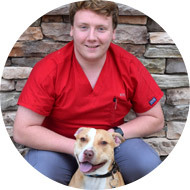 Dr. Ivan Pryor, DVM, is owner and head veterinarian at Dillsburg Veterinary Center. 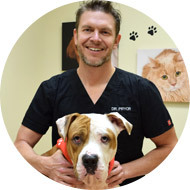 He is a member of both the Pennsylvania Veterinary Medical Association and the American Veterinary Medical Association since 2000. Dr. Pryor received his undergraduate degree majoring in pre-med with a minor in biochemistry from the University of Colorado in 1995. He graduated from Kansas State University in 2000. Dr. Pryor moved to Pennsylvania that same year to join the Mr. Shadow Animal Hospital team in Schuylkill Haven, PA. He purchased the Dillsburg Veterinary Center in July 2005. Ever since Dr. Pryor was a child, he knew that he wanted to take care of the needs of all animals whether large or small. He treats all animals as if they were his own. Dr. Pyror resides in Dillsburg with his wife, Sharon and their two daughters Lauren and Emma. In his spare time, he loves spending time with his family, whether kayaking down the river or fresh water fishing. Dr. Pryor lives and active lifestyle through running and adventure courses that challenge his agility, balance, and strength. He enjoys restoring classic Ford Broncos and is a huge fan of the Kansas City Chiefs. He has two Labrador retrievers, Charlie and Lola. Amber was born and raised in York County, Pennsylvania and graduated from Northeastern High School in 1997. She attended West Virginia Wesleyan Collage from 1998-2001 and received BA majors in Dramatic Arts/Communication and Chemistry, with minors in Human Biology and Music. 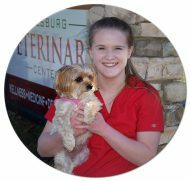 She had many interests during that time and it wasn’t until the end of her sophomore year that she knew she wanted to be a veterinarian. She then continued to Auburn’s College of Veterinary Medicine from 2001-2005. She worked in Red Lion, PA for her first year after graduation in a small animal practice, but moved back to Alabama when she married her husband in 2006. She worked at a 24 hour emergency hospital from 2006-2013 which she loved. After a few personal life changes, her and her husband decided to move back to Pennsylvania. She has been working at DVC since 2014. She has three children, Paisley, Tucker, and Cedar, who always keep her on her toes and remind her the importance of the little things. She currently has a yellow lab named Remi and a brown tabby named Purrcy. 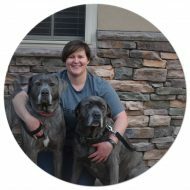 Dr. Lesley Hlatky was raised on a small horse farm in California where she quickly established a passion for animal care. 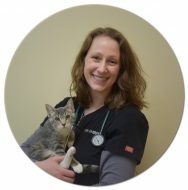 She received her Bachelor of Science in Pre-Vet Med from California Polytechnic State University, San Luis Obispo, followed by her Doctor of Veterinary Medicine degree from the Ohio State University. She has lived in Dillsburg since 2001 with her husband Greg. They have two children, Aiden and Dannielle, a flat coat retriever Tate, a pitbull mix Jefferson, a housecat Josie and two horses, Brody and Lucille. Dr. Hlatky and her daughter are actively competitive jumping their horses. Greg and Aiden enjoy golf, fishing, hunting and baseball. When not at work, Dr. Hlatky can be found at any and all of the above listed sporting events, usually dressed in her riding clothes and covered in dirt. The backbone of the “business side of things”, Sharon has been Office Manager of DVC since 2005. She is inspired by The Bible. Her most important life event has been her marriage to Ivan and the birth of their children, Lauren and Emma. She admires hard work and integrity in others. If Sharon is not working, or attending her children’s activities, she enjoys quiet date nights with her husband or physical fitness such as running or doing workout tapes in her home gym. Her furbabies include two Labrador retrievers, Charlie and Lola. 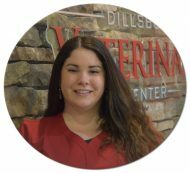 The “glue” of DVC, Laura started out at DVC as a part-time kennel technician in 2014. With her “sky is the limit” attitude, she quickly learned technical, administrative, and management skills that created her role as Team Leader. Her furry family includes a dachshund named Oscar and two cats, Minnie and Marven. She loves to travel, sightsee, and be a typical tourist every opportunity she gets. Laura credits her strength and determination from her role model, her mother, who she also considers her best friend. She admires honesty, positivity, integrity, and a sense of humor in others. The “prankster” of the clinic, Cindy is always making our DVC family and clients laugh. 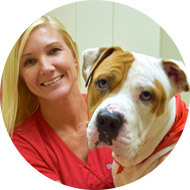 She has been in the veterinary field for over 15 years. 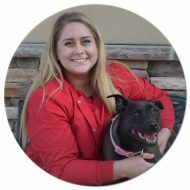 Her furry family includes her black lab, Sylas Gunther, and her two cats, Thuddeus Alexander and Tommy John. 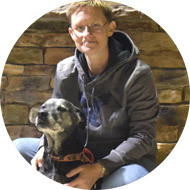 Cindy started pet therapy with Sylas, and he became certified in December 2018. When she has free time, she is taking Sylas to senior homes and youth centers to provide therapy for the residents or crocheting at home. 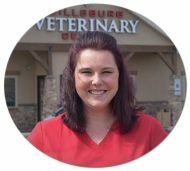 With a bright and shining smile and attitude, Kelli feels that being a Veterinary Technician is the most important aspect of her life. She strives to give her patients the highest standard of care and compassion. She is not only an amazing technician on our team, but she is also DVC’s Equipment Manager. She makes sure that all of our equipment is properly maintained, cleaned, and repaired when needed. Kelli has a son named Lance. She also has a large furry family that includes horses, ponies, three dogs, one Columbian red tail boa, and one sulcata tortoise. A little-known fact about Kelli is that she met and had lunch with Reese Witherspoon. Next time you are in our clinic, ask her about this fun story! 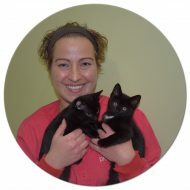 Eager to learn and always wearing a smile, Kelsey graduated from Wilson College in 2014 with a Bachelor of Veterinary Medical Technology and minored in Biology and Chemistry. She went to a small high school with a graduating class of only six people. Her role model is her Youth Pastor, and her most important life event has been seeing her grandmother overcome cancer. Kelsey has a maltese/yorkie named Sadie. Bringing her dog home is one of the most treasured memories she has. The “Busy Bee” of our clinic, Tasha must always be productive with her time at work. She is a “go to” for many tasks at DVC. She is a mother to her three-year-old son, and she has a husband and coonhound mix at home. Her favorite vacation spot is Disney World. If she could have one more pet at home, it would be a pig. Tasha most admires honesty in others. She is a firm believer in karma, and she treats everyone with the utmost respect and compassion. 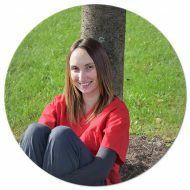 With a strong passion for physical therapy and rehabilitation, Elaine is one of our skilled technicians. 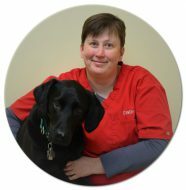 She is a Certified Veterinary Technician and Wilson College alumni. 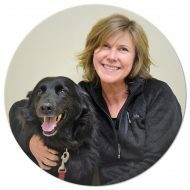 She also is a Certified Canine Rehabilitation Practitioner from University of Tennessee. When she isn’t spending time with her dog or four cats, she is often hiking, kayaking, or spending time with her friends and family. If she could have one more pet it would be a horse. 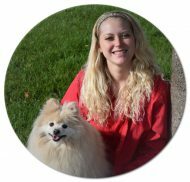 Excited to grow and passionate for her field, Amy graduated from York Technical Institute in 2016 with an Associate’s Degree in Veterinary Technology. She is a wife and mother of three children and five furbabies. She enjoys canning fresh vegetables from her garden, hiking, camping, fishing, and almost anything outdoors! If she could have any pet, she would love a sloth or fruit bat. 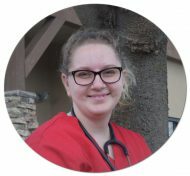 New to the veterinary field but eager to learn, Kayla is a 2019 Veterinary Technology graduate from YTI Career Institute. Her favorite quote is “Live, Laugh, Love”. In her free time, she enjoys hiking, bike riding, metal detecting, and playing video games. Her furry family includes two dogs, Charlie and Shadow, and one cat named Smokey. A “perfect” day for Kayla would be going on a several mile hike with her husband Brandon and her dogs. The face and voice of DVC since 2006, Debbie truly loves all animals and humans. She is inspired by courage and kindness. Her role model in life is Jesus. If she isn’t at work giving every dog a treat or at home cuddling her furbabies Spud, a chihuahua and Willow, a manx cat, she is fishing with her husband Greg off the New Jersey coastline. Her most treasured memories are those with her children and grandchildren. The woman who gives so much and sleeps so little, Brooke is one of our great Client Care Representatives. She works full-time with us and nearly full-time bartending. 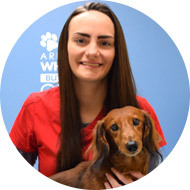 Brooke is currently in college for Veterinary Technician. Even though she has her plate full, she wouldn’t have it any other way! Her favorite quote is “whoever said diamonds are a girl’s best friend, never had a dog.” When she has free time, she enjoys being with her dog Bella, her cat Chloe, and her family. With her contagious smile and laugh, Allie is one of our amazing Client Care Representatives. Her favorite activities include spending time at the shooting range with her husband Nick and having dance parties with her daughter Aubrey. She has a dog named Diesel, a cat named Tres, two goats, and two ducks at home. She would love to have a horse one day. Her most treasured memories are those when her whole family is together. Always smiling and thinking ahead, Sarah is one of our compassionate Client Care Representatives. After spending several years living in New York City, she currently lives in Harrisburg with her fiancé Pike. She spent some time studying abroad in Scotland. An interesting fact about Sarah is that she likes to learn and speak in different dialects. She is inspired by Michelle Obama, and her role model is Louise Belcher. She enjoys acting, knitting, and playing tennis. A compassionate and fun soul, Jacque treats every animal as if they were her own. She graduated from Mansfield University. Her furry family includes four dogs (Sarge, Onyx, Aspen, and Daphne), one cat (Sam), one bearded dragon (Sprout), and one leopard gecko (Petey). When she isn’t playing and caring for our boarding pets, she is spending time with her own animals, riding her motorcycle, or target shooting. If Jacque ruled the world, the first thing she would change would be animal cruelty laws. When Jess is not giving love and attention to our boarding pets, she is often volunteering at Speranza Animal Rescue or transporting dogs for other rescues. She is a full-time teacher who works very hard so that her dogs can have the best life possible! She has two Cane Corso’s at home, Deuce and Bubbles. If she isn’t out enjoying an activity related to dogs, you can find her wood working.